For high power demand or critical facility backup, Power Solutions has generator rental options available for just about any requirement – nationwide. Our vendor-neutral inventory allows us to offer you a variety of top manufacturers that best fit your application, cost or timeframe. 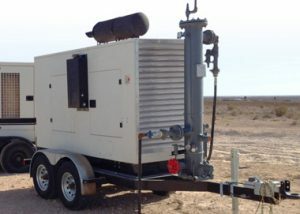 Our generator rental inventory includes diesel and natural gas generators. Whether the requirement is an emissions compliant diesel generator in a sound attenuated enclosure, or an open skid natural gas generator for prime power, we have units in stock and are prepared to roll to your facility. Dealing with unexpected or planned outages requires an engineered solution from experienced power generation specialists like Power Solutions, LLC. Mobile trailer, skid on trailer, and larger ISO trailer module diesel generators. From 100kW and up, including paralleling solutions for multiple MW requirements. Single, double and triple shift rates available upon request. We offer Diesel Generators in the following kW’s. Natural gas, dual fuel, propane and field gas generator packages are available for short-term rentals or long-term rentals or lease. Give us a call for current competitive runtime rates. We offer Gas Generators in the following kW’s.